A Yummy Shrimps Curry! 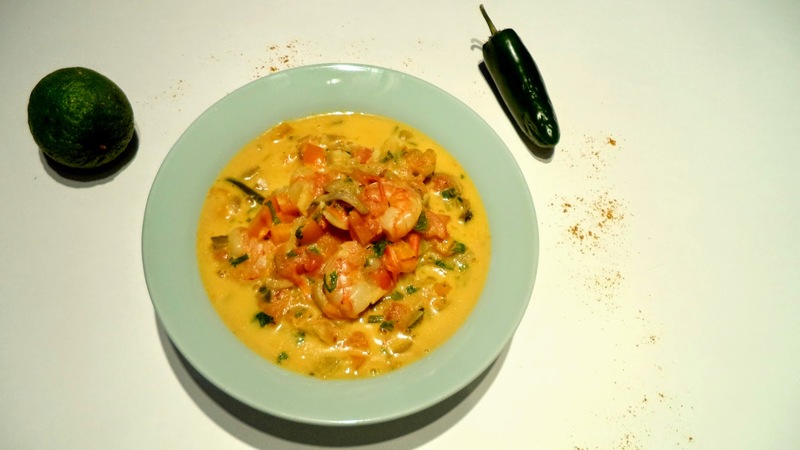 | A Hint of Rose: A Yummy Shrimps Curry! Curry is my favorite spice! If I could, I’ll use it in any recipe! So, it was only a matter of time before I post a curry recipe on my blog. And because I live close to the sea, it will be a curry with shrimps! This recipe is really simple, you just need to cut and let simmer! Fry the onion with a bit of oil. I chose coconut oil, but you could also choose olive oil. Once the onion is golden, add the garlic and the ginger. Then add the tomatoes, pepper, mushrooms and chili pepper. Cook for a few minutes, then add the coconut milk, a pinch of salt and the curry (as you can see in the phot I put a LOT). Let simmer for about 10 minutes. Add shrimps and let simmer until they are totally cooked. Add the lime juice and the cilantro.